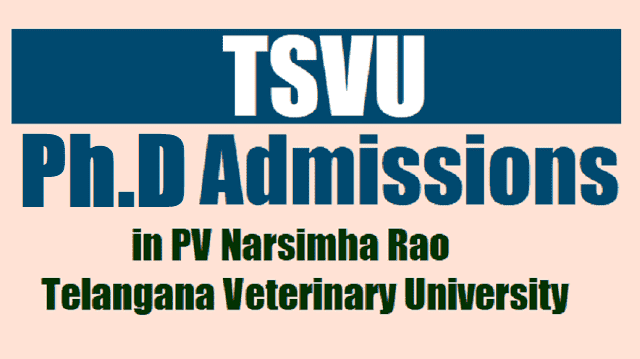 PVNR TSVU/Telangana Veterinary University Ph.D course Admissions 2018/ PVNRTV University Ph.D course, TSVU Ph.D course Admissions 2018 in PV Narsimha Rao Telangna Veterinary University : TSVU Ph.D course Admissions 2018, TS Veterinary University Ph.D course admissions, Online application form, Last date for apply, Prospectus and more information @ tsvu portal. PV Narsimha Rao Telangna Veterinary University has published the Ph.D course Admission notification and applications are invited from the eligible candidates for admission into the Ph.D course in the Faculty of Veterinary Sciences in PV Narsimha Rao Telangana Veterinary University, Rajendramnagar, Hyderabad for the academic year 2018-2018. PV Narsimha Rao Telangana Veterinary University (PVNR TVU), Hyderabad invites applications for admission to Ph.D course. Eligibility: 60% marks in Master of Veterinary Science. Age: Upper age limit is 50 years as on 01.07.2018. How to apply: Duly filled in application along with attested copies of required certificates reach the Registrar, PVNR TVU, Administrative Office, Rajendranagar, Hyderabad on or before either in person or by Post. 1. Hall Ticket shall be presented to the Supervising Officer at the Entrance Test Centre. Candidate without the Hall Ticket shall not be allowed for the entrance test. 2. No travelling expenses will be paid for appearing for the entrance test. 3. Violation of any instruction and adoption of any malpractices in the Examination Hall shall render in cancellation of his/her answer-script and forfeiture of his/her claims for appearing in the Entrance Test. The decision of the Chief Superintendent of Entrance Test Centre shall be final in all these matters. 4. The candidates will not be admitted to the examination after the first 10 minutes and will not be allowed to leave the examination hall till the first half an hour is over. 5. Mark your Question Booklet Series on OMR Answer sheet by darkening the appropriate circle with Black Ball Point pen Only. 6. The candidate has to select the correct answer and mark it on the OMR Answer sheet by darkening the appropriate circle for the respective question by using black ball point pen only. 7. Issue of Hall Tickets and appearance in the test does not automatically entitle a candidate for admission. Huge and great list you have shared with us. Actually i am searching for the Top 10 Engineering Colleges in India and i get here some infromation. This is really awesome. By seeing this i feel so relief. Keep up the good work like this.